Do Bed Bug Bites Spread on your Body? Bed bug bites on arm. Multiple bed bugs will cause bites in multiple areas on the body. Reader Question: Do bed bug bites spread on your body? Most people see a skin reaction within a day of being bitten. 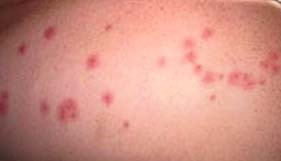 Bites from several bed bugs can be seen at the same time on the back, hands, face, and arms (exposed skin areas during sleep.) Bites are usually grouped together in clusters of 3 or 4. Bites do not spread, however, a highly allergic person might see a bigger reaction over a larger body area than a person that isn't as allergic. In general, the answer to your question is no. As an aside, bed bug bites are also frequently confused with bites from spiders, ticks, fleas, and mosquitoes.